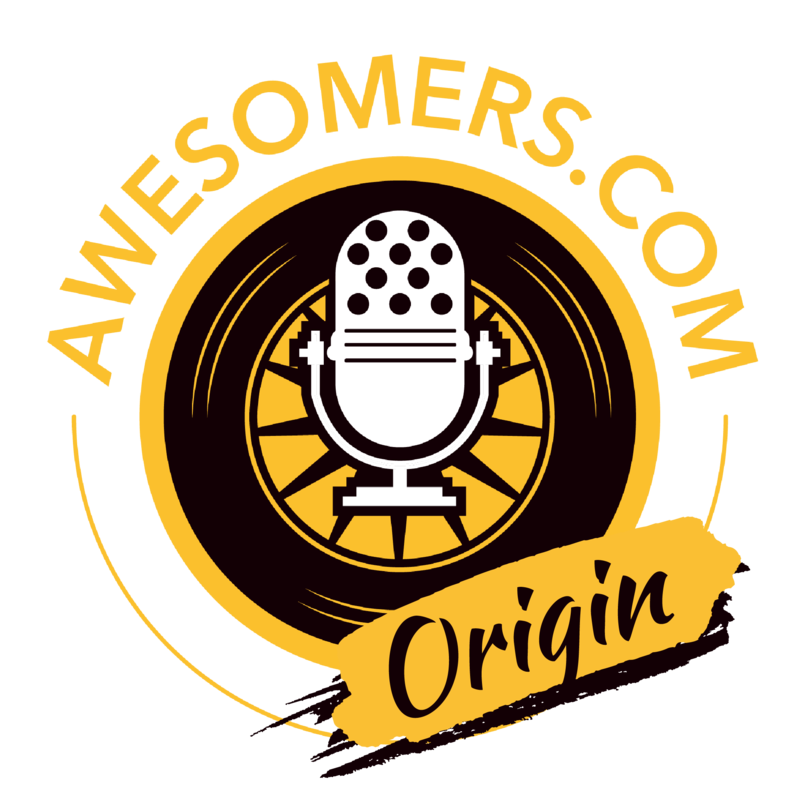 Awesomers Origin - We'll talk to an Awesomer about where they came from, the triumphs and tribulations they have faced and how they are doing today. An Awesomer Origin story is the chance to hear the backstory about the journey our guest took on their road to become awesomer. These stories are incredibly varied and the takeaway is that awesomers come in all shapes, sizes, backgrounds, creeds, colors and every other variation possible. On your awesomer road you will face adversity. That’s just part of life. The question as always is how YOU choose to deal with it. Mario started his story as a performer. As soon as he was able to walk he was sneaking into the waiting room of his father's chiropractic clinic and putting on shows for the patients who were waiting. Everyone loved his shows…except for the staff who grew tired of seeing the same renditions of Dumbo, Willy Wonka and The Chocolate Factory, and The Wizard of Oz over and over again. Little did Mario know at that time that performing and teaching are brothers. As he got older his love of performing matured into personal growth and development with the intense desire and intent to take what he learned and teach others. Loving people and helping them to genuinely smile from inner joy has always been the heart of my mission. After high school, Mario pursued his second love in life with the goal to change people’s lives using it as a medium—food. He was a very successful chef for nearly six years before the intense calling of working more closely with others was too loud to ignore. Food as an experience has always been and will always be a major part of my life. From cooking with my grandfather at a young age to devoting the early part of my life to it—food will always play a major role in what I do and how I communicate. He left the kitchen and started his own business, ironically out of his father's chiropractic clinic, coaching people to reach their health, wellness, weight, and mindset goals. As Mario operated this business he was also spending every available second studying mindset, psychology, personal growth, spiritual development, and more to apply what he learned to his own life and to, more importantly, be able to serve others at a deeper more profound level. Mario has authored two cookbooks geared toward healthy living and has also authored a third book centered around achieving personal and business success. Mario has appeared on TV over 50 times promoting his books and business and has been a featured speaker for numerous groups, events, schools, and corporations. Mario’s main focus is sharing ideas through food in a unique way that helps busy achievers think better and do better so that they live better. Mario resides in Pittsburgh, Pennsylvania, with his girlfriend Erica and their puppy Waldo. Cultivating a growth mindset creates fulfilment within yourself and the world around you at your fullest capacity. How the 10 Minute Mindset podcast works. The Gratitude Intention Outcome (GIO). How important mindset transformation is to entrepreneurs and Awesomers in general. So listen to today’s episode and find out about how you can even maximize your life by having the right mindset. Welcome to the Awesomers.com podcast. If you love to learn and if you're motivated to expand your mind and heck if you desire to break through those traditional paradigms and find your own version of success, you are in the right place. Awesomers around the world are on a journey to improve their lives and the lives of those around them. We believe in paying it forward and we fundamentally try to live up to the great Zig Ziglar quote where he said, "You can have everything in your life you want if you help enough other people get what they want." It doesn't matter where you came from. It only matters where you're going. My name is Steve Simonson and I hope that you will join me on this Awesomer journey. If you're launching a new product manufactured in China, you will need professional high-resolution Amazon ready photographs. Because Symo Global has a team of professionals in China, you will oftentimes receive your listing photographs before your product even leaves the country. This streamlined process will save you the time money and energy needed to concentrate on marketing and other creative content strategies before your item is in stock and ready for sale. Visit SymoGlobal.com to learn more. Because a picture should be worth one thousand keywords. You're listening to the Awesomers podcast. Steve: You are listening to episode number 36 of the Awesomers.com podcast series, this is episode 36. So to find show notes and details related to this particular episode just go to Awesomers.com/36 as always, that's Awesomers.com/36. Now today my special guest is Mario Porreca and I probably got his last names mispronounced that's my custom. But I want to just share with you some of Mario story now he started as a performer as soon as able to walk you was sneaking around the waiting room with his father's chiropractic clinic and putting on shows for the patients who were waiting. Everyone loved him, his shows, except the staff who grew tired of him. Same renditions of Dumbo, Willy Wonka and Charlie and the Chocolate Factory not to mention Wizard of Oz over and over and over again. Little did Mario know at the time that performing and teaching our brothers. As he got older his love for performing matured into personal growth and development with an intense desire and intent to take what he learned and teach it to others. He loves giving people and helping them to earn a genuine smile from their inner joy. And that's always been at the heart of his mission. After high school Mario pursued his second love in life with the goal of changing people's lives using his passion as a medium and that passion was food. He was a very successful chef for nearly six years before the intense calling of working more closely with others was just simply too loud to ignore. Food as an experience has always been and will always be a major part of his life. From cooking with his grandfather at a very young age to devoting an early part of his life to it. Food has always played a major role in how he communicates and how he lives. He left the kitchen to start his own business ironically out of his father's chiropractic clinic. Coaching people on how to reach their health and wellness, weight and mindset goals. As Mario operated this business he was also studying and spending time every available second about mindset, psychology, personal growth, spiritual development and much more to apply what he's learned in his own life. And to be able to take that and help it serve others at a deeper more profound level. Mario's authored two cookbooks geared towards healthy living. He's also authored a third book centered around achieving personal and business success. Mario has appeared on television over 50 times promoting his books and his businesses and has been a featured speaker for numerous groups events schools corporations etc. Were thrilled at Mario on board and he's joining us today from Pittsburgh Pennsylvania let's listen in now and see where this Awesomer journey takes us. 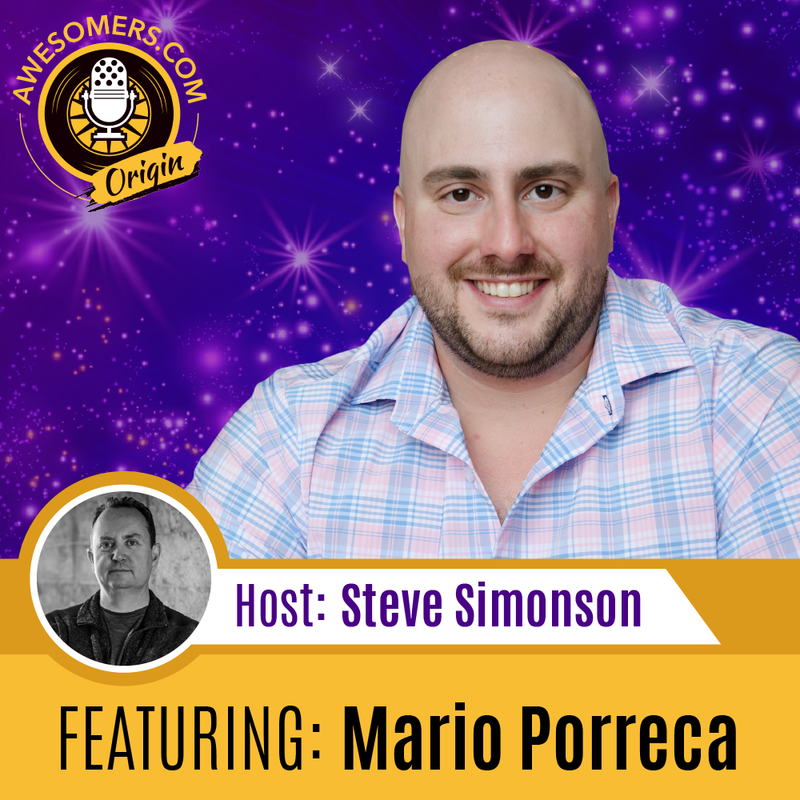 Awesomers we're back again, it's Steve Simonson and I'm bringing you a very special guest Mario Porreca, am I getting all right? Steve: I'm only about 50% this month on getting a pronunciations right. Mario: It's a tough name it's even harder to spell. Whenever someone asks me my last name I always have to point out it's two R's one C because people tend to want to do it the opposite way. So it's all good. Steve: Porreca. Okay so just for those keeping score at home most of the people call me Steve Simpson despite no P in my name at all. So I'm right there with you when it comes to challenges with the last name. So Mario thank you for joining us. We've already kind of read the intro a little bit about your bio on history which sounds fascinating by the way. But if you could just help us in general terms kind of tell us what takes up your time on a day to day basis today. Mario: Yes. On a day to day basis, well my every morning starts with my podcast 10-minute mindset. So that's how I start every single morning and we go through a specific routine on that podcast called the GIO method which stands for Gratitude Intention Outcome. And it's a way for busy achievers to set the foundation for their day because what I noticed was I do a lot of coaching as well. And what I noticed was the people that I'm coaching they tend to start their day off in a pretty bad state. Whether they're sitting in rush-hour traffic or they sleep in and hit snooze too many times they tend to start out just on a low energy profile in a pretty negative way. And that bleeds into every aspect of our life. So if we can start what my intention was to help people start their day in a powerful way from a place of intention creating clear outcomes and to be able to build throughout the day. Action items that will actually help them build momentum towards those outcome. So every single morning Monday through Friday, we start with 10-minute mindset and that is alive. I do it live at 7:30 in the morning and then I upload the recording as a podcast because I know that I'm not naive. I know people on the west coast aren't gonna get up at 4:30 in the morning to listen to a live call. So they can get it on the podcast and the podcast version of it actually has taken on a life of its own. So that I put a lot of time and energy into that first thing In the morning and then throughout the day. It's basically I always make sure I get to the gym at some point throughout the day that's my time. So I spend an hour a day at the gym. I like to lift weights that's what I do but aside from that I'm talking to clients. I do some coaching. I do a lot of cooking because I used to be a chef. So I have I do public speaking that's a full-time thing that I do. So I'm planning speaking gigs. I'm traveling and I use cooking in my talks to share ideas and to help entrepreneurs share ideas and busy achievers. So I have a lot of things that I go on and every day. It's fun, it's a day-to-day thing depending on what my schedule is doing podcast interviews. Interviewing for my podcast speaking and coaching but my main objective every day is to just get in the flow and to get into peak state and to stay there as long as possible. Because I read a study a while ago that they did where and this keeps coming up on my podcast and everything that we talk about where they studied people who are on their deathbed and they asked them. They did it for a large group of people. This was like a seven year long study and they wanted to find out the people with write before they pass. Who are the most fulfilled? Who are them happiest and what they found was it's not the people who went on the most vacations. It's not the people who made the most money. It's not the people who are the most famous but it was the people who spent the most time in the state of flow or in their peak State. And what that means is if you've ever started a project or something that you really enjoyed. And you put an intense amount of focus into and you started it and you're working and you're doing your thing and then all of a sudden you look up and five hours have gone by and you're like where did that time go? That's being in that state of flow where you're just flowing and your energy comes out and you're doing what you love to do. So the people who spend the most time at that place are typically the people at the end of their life that feel the most fulfilled and they feel like they got the most out of life. And they contributed the most to other people which in turn creates fulfilment. And so that's kind of my objective everyday is how do I get into this state of flow and how do I stay there as long as possible. Steve: I love that and there's so much to talk about with the ten minute mindset and this concept of GIO which I'm already in love with. And then we use the I guess parable about what do you want to be said on your deathbed or what do you want the environment to be around your deathbed and I've reflected in the opening Awesomers podcast that nobody is going to be at their deathbed and push little Timmy forward and Timmy I just need to know what's my google ranking today right. Nobody cares that that's just not part of what life is really about. So I love all this. We're gonna talk about more in depth and get into your origin story. We're gonna do it right after this break we'll be right back. Hey Amazon Marketplace professionals! Congratulations on your success today your creativity, strategic vision, problem-solving and discipline have allowed you to build your own E-commerce business. Wouldn't it be great if you had more time to focus on the things that truly drive the sales and growth of your company instead of getting lost in a dozen different services and countless spreadsheets? What if there was one system that connected to your Amazon account that automatically give you the information that you need it to make great decisions and really impact your business. Parsimony ERP can do that. Parsimony is the business operating system for your marketplace business. With Parsimony you get true double entry bookkeeping, easy financial statements, full customer service tools and item-by-item profitability along with project and task management and more features are being added all the time. Learn more at Parsimony.com, that's Parsimony P-A-R-S-I-M-O-N-Y.COM. Parsimony.com, we've got that. You're listening to the Awesomers podcast. Steve: Okay we're back again Steve Simonson here with Mario Porreca. Steve: I'm one for to come back to my 50%. Mario: I just want to point out too. I love the break that we just took because I come from a background in radio. So I did rate, I had my radio show like terrestrial radio show for three years the thing with the dial on it heard of it? Steve: Yes I look that up on Wikipedia but I've actually used one. Mario: And so that took me back to those days when we would take commercial breaks because we actually had sponsors for the program that allowed us to be on the air. So it's like a blast from the past. I love it. Steve: It is yes and you know in our version of the world, we kind of take those breaks and we have a couple sponsors that are basically other companies that I either fund support or own to just try to help pay some bills. Because as it turns out nobody pays me to do a podcast. I don't know if you found that with your podcast but nobody's writing checks. So really I make millions with my podcast. So that's another thing it's a good time for people to run out there. The name of your podcast is a 10-minute mindset right? Steve: So let's everybody get out there go subscribe to that and take a listen what a great idea to be able to have kind of a daily check-in to get your mind organized first thing. Also West Coast ease. We can do it just about as early as we like it sounds like and the East Coast days do it at 7:30 a.m. live or hear the podcast at their leisure. So really smart. Mario: Every morning 7:30 a.m. we do it live and then by the time I get it. I do clean it up a little so I get the recording after the live and I edit out content but I clean it up. So it's just a cleaner to listen and it ends up being somewhere between 11 and 13 minutes typically but it's always good stuff. And I usually get the day's episode up no later than between 9:30 and 10:00 a.m. Eastern Time. So between 6:30 and 7:30 on the west coast you'll be able to do that. Steve: It's truly a lot of plate spin. And so before we kind of dive into some of those day-to-day plates that you unpacked for us earlier. Let's talk about where you came from, where were you born Mario? Mario: I was actually born in Davenport Iowa and my father was in chiropractic school at Palmer College. And I lived in Iowa all of two weeks and then we moved back to Pittsburgh where I grew up and I live today. So yes it was a little bit of a trek but the funny thing about that story is when I got my driver's license. My birth certificate got misplaced and it was such a headache to have to get it from Davenport and have the mail it here. So that's just a funny thing that I lived there all of two years but it still had an impact in my life later. Steve: Yes, you say two years or two weeks? Mario: I'm sorry two weeks two weeks. Steve: I'll just say even two weeks you just don't have time to sit down roots. So Devonport is probably you're not visiting it and thinking about the olden days your guy. Mario: I have gone back a couple times but there are no real olden days for me to remember. So it is a fascinating place. It's a great little town. I do enjoy visiting. Steve: I love it. So in Pittsburgh. Now I give us a sense of what did your parents do your obviously everything from a chef to kind of entrepreneurial coaching and so forth you've carved out this life. What about your parents? Mario: Yes well my dad's a chiropractor. So he's had his own business is in clinic for over 30 years and my mother is a registered nurse. But after I was born she went and worked with my father. So she is the office manager at his practice and he works in his practice now three days a week and the other days he goes around and he does speaking. And he speaks on health, natural health, toxicity, functional medicine things of that nature. So I grew up around knowing the value of health knowing value of taking care of yourself. And that's what really kind of ultimately led me in the direction that I'm in today and kind of a roundabout way. And I grew up around a business owner and family that was when you're an entrepreneur you know better than anyone, you eat what you kill and I grew up around that and that mindset. So when I first started as a chef and I actually went and worked for someone else to learn the ropes. It was very foreign to me, it was very different. I didn't like the idea of somebody else telling me when I had to be at work and what I had to do when I was there. And when I was allowed to go home. And if I was allowed to go on vacation and to me most people it's the other way around. They not only say most people but a lot of people they grow up with that employee mindset and that's rapidly changing today. And it's just such a breath of fresh air to see how entrepreneur ISM and owning your own business and even starting an online venture is really becoming a mainstream. Respectable thing that most people aspire to. way it is evolved happily is that it's now seen as you know part of a potential for freedom lifestyle. It's a potential to make your own choices the of course myth as the e-myth calls it of you being your own boss is hilarious because you just have a bunch more bosses. When you have a bunch of customers and you have to learn how to make those customers happy and so forth. And this idea that you don't have to work now that you're the boss that you know nothing further from the truth until you get your systems and processes in place. So it's a great thing though that to see the gig economy taking off and see people have choices that I was talking with another company about entrepreneurial exit strategies. And he referred to it as option strategies instead of the concept of when can I sell my business it's like I'm gonna run my business. As if I'm gonna own it forever. And along the way I'm gonna get so many offers for it because it's so valuable I have. And that's really what freedom comes from this options, don't you agree? Mario: Absolutely those options are crucial and the funny thing is, when I first started in business for myself which was a little over 10 years ago. People would always they would think it was such a mystical thing because I was pretty young at the time. I was in my early 20s and they would say well I bet you get to sleep until 11:00. And you don't have to send an alarm clock unless I said, well yes I can if I want to but if I want to eat and I want to live indoors. I don't do that because you do have the options but again if you're passionate about what you're doing - you don't want to stay in bed you want to get up and you want to go out. And you have so much more energy and more enthusiasm for taking on the day. So I think that the outlook that you just explained where you want to run your business for forever but you have options along the way is a great way of looking at it. Because if you start a business with the intent to sell the first day you start it are you really gonna operate at the highest level because you're just trying to offload and that's your game plan. And I'm really that believes in the long game playing that long game. That long-term game. I'm willing to leave money on the table today if I know that I can come back later and pick up more and serve better and pick up more later on. And that's just always been my philosophy is what in the long term is gonna serve the customer better. What in the long term is gonna build is more of a solid foundation for me. And so I've turned things down in order to pick more things up later. And so I believe that long game and if I was someone who said I want to sell my business that I started within four years, I probably wouldn't do that. And by making those decisions I probably wouldn't serve my customers as well. And I probably wouldn't be in a position that I am. So that long game is so important. Steve: It truly is and that is for sure a normal Awesomer mentality to say. Even if today I could take something easy and have a short-term gain. I will forego that in the concept that the long run will be better and for everybody and without delay. Even now once you understand that the long game exists. And that it's worth so much more when you let it marinate and do the right things. Definitely I think that's a very salient point. So let's talk a little bit more. Now did you attend University? Mario: I did. I went to Community College and the reason I did that was I when I first was in high school I knew I wanted to be a chef. That's why when I was growing up my as I said my father would travel a lot. So he would speak or he would be out at seminars for chiropractors and things of that nature. And so when he would travel a lot of the times I'd go with him. But a lot of the times too, I would stay with my grandparents which were his mom and dad and my grandfather came from Italy. And when he retired he owned, he was an entrepreneur as well. He owned a very large commercial construction company in the 70s and 60s and 70s. And when I was born was the year that he ended up retiring. So when I would stay with him we would have a couple activities. Number one he had a full woodworking workshop in his basement. So we would go and make things in the basement which I thought was a blast. So I got to work with my hands but then we would cook because he loved to cook. And so him and I would cook together and that's where my love of cooking came from. We'd watch the Food Network when it's early days. I'm talking like Emeril live days back then which was awesome. And we would cook and so then I knew I wanted to be a chef. First I wanted to be a carpenter and then I wanted to be a chef. So when I graduated high school I was gonna go to the CIA, Culinary Institute of America in Hyde Park New York. That was my first goal but I realized that's a very very... it's called the Harvard of cooking schools. It's a very expensive school to attend. And I realized that I never worked in a formal kitchen before at that point I had other jobs but I never worked in the kitchen. So I thought if I go there for even a semester and I don't like it. Then I'm costing my dad a lot of money because he had me but he was gonna pay for my schooling. So I ended up saying look I'm gonna go to Community College for a semester. If I really like it I can always transfer, if I don't like it then nothing gained nothing lost, I can switch and we didn't lose too much. So I went to Community College. I ended up landing an apprenticeship at the number one city club in America which is here in Pittsburgh. Which was much more valuable than any education I could have gotten just going to school. So I went to school one day, a week although all day long and then I worked like 60 hours a week at this place than that but I got paid to go there. So I ended up paying for my entire education myself in cash because I was working all along the way. And I got a much better education that I would have gotten anywhere else. So I started there in the kitchen that so I did an upper three or apprenticeship and one day a week went to school. But when I went to school I went from like 9 a.m. to 9 p.m.. So it was like a 12-hour school day Wow and the rest of the week I was working a lot of hours in a very intense environment. Steve: Yes that kind of work in itself is already very demanding and it's yes because it's kind of a retail focused you got to be early. And late it's just a very grueling a situation. It reminds me of how people go through whatever printers, ships, medical school or these things and they're just absolutely grueling at those times but you learn so much right. I mean that's ultimately where you got your skills I'm sure. Mario: Absolutely and I wouldn't trade this day even though there were a lot of hard work I did that for I ended up staying on after I graduated. And I was there for an additional about three years after my apprenticeship. And I was worked in management at that point and I was a kid in his early 20s managing 40 cooks and most of them were older than me. So it was a great experience I learned a lot about. I learned a lot about work ethic. A lot about hard work. A lot about commitment and a lot about dealing with people and different personalities and being able to manage people and being able to gain respect from people who put in a lot more time and effort up to that point. And so those skills, the skill sets that I learned there were very very valuable to me along the way and of course the food is something I've always been passionate about. And I've always will be just not in the capacity of cooking professionally for a paycheck week to week. Steve: Yes. I understand completely. So that's an amazing lesson that you've learned so far in your journey. When we come back we're gonna talk again a little bit more about us, maybe some aha moments or some defining moments that Mario had along his journey and we'll be right back right after this. Empowery, the name says it all. Connecting E-commerce entrepreneurs with great people, ideas, systems and the services needed to sustain business dynamic into growth. Empowery is a network; a cooperative venture of tools and resources to make you better at what you do. Because we love what you do. We are you. Visit Empowery.com to learn more. You're listening to the Awesomers podcast. Steve: Okay we're back again everybody Steve Simonson here on Awesomers.com and Mario was just kind of some of the big lessons they've learned along the way during his apprenticeship and time at university. And I love the fact that you say I wouldn't trade that time for anything despite it's hard grueling hours and so forth. And that really is something that I enjoyed that there are some times that I had where I worked for literally 2 to 3 years in a row without a single day off. And although it was tough and it was hard to do. And I don't really want to go back there and do it again. I don't bemoaning. I'm not sad about it. It just it helped me get to where I am. Is that kind of how you look at it as well? Mario: Absolutely I mean when I worked in the restaurant world for six years. I got one Saturday off in six years. So it was a lot and there was a stretch there at one point during our busy season. And we used to get really really busy that I worked like 35 straight days without a day off and it was intense and it was tough but at the same time as you said in there. This is ten years later I still have dreams that I'm working there again. So that's how you know I'll wake up and I'll be like in a cold sweat and be like what is going on. But it was a great experience the people I worked with were phenomenal the boss that I had the executive chef. I still talked to him to this day he has had a very profound impact just a total professional and someone that I aspired to be like that taught me a lot. So I mean and he gave me a shot Len. I had no other background at that a very high-end property and so he worked hand in hand with me to teach me the ropes and show me think so. It was a great experience I like I said I wouldn't trade it for anything. It was the foundation that I was able to build everything up to this point on. Without that I don't think I would be here today. Steve: As I like to say that's just kind of intellectual equity right. All those the behaviors and the patterns and the things that we learned, the skills and so forth. All that's intellectual equity. So I love to hear that. Now let me ask you this, was there any defining moment between kind of then and now, that kind of help put you on the road that you could share with us? Mario: Well the two come to mind first. The first one was when I was still working there and I'll tell this story real quick. I don't think I've ever told this story before. So I'll tell it real quick, this is where I learned that mindset was so important and what actually got me into it. I was working in there's when I first started working in the restaurant world we started they started everyone off in the salad pantry. So all you would do is make salads and there were different salads and you would do the fruit for someone ordered fruit for dessert. You would peel it, cut it and serve it and all that stuff and then once you got done with salads and you got your first promotion. Because this is the old French Brigade style kitchen keep in mind. It's not like the kitchen you'll see at Applebee's down the street. This is old-school in the textbooks type thing how it was run. So once you graduated from the salad pantry you got promoted to a station called garbage A and garbage A is the cold kitchen. So it's all the cold appetizers, it's like making pates and terrines and wood anything called salad dressings. And just things of that nature making like the crab cakes. We wouldn't cook them but we'd make them. And so there was a lot of responsibility there because a lot of the hors d'oeuvres are very intricate. And you don't see that in a lot of kitchens anymore. So this is something that was very very classical but kind of outdated. It's the hardest station to run in the entire kitchen and typically they would have two people that would run that station, sometimes three depending on how busy we were. Well when I first got promoted to there I got move there out of necessity because the person who is ahead of me just didn't show back up after lunch. And that happened in that place quite a bit because there was a lot of pressure. So they said guess what you're going over there. So I went over there and I knew nothing about it and I was by myself there. And I thought and I looked at the executive sous-chef as I was walking over there and I said what do I do and he looked at me and he just said sink or swim and that's all he said. So I had to go over and I had to figure it out and I didn't know where anything was I didn't know was on the menu. So I thought if I can just get through today then tomorrow they'll have someone working with me that can train me and teach me well that ended up being a year of me working that station by myself. But in any case I'll never forget one day when I was over there and this I was in the weeds which is common term used in the cooking industry way behind and you're freaking out and you're sweating. And there was a dish on the menu that just came out. It was duck I don't know if you're familiar with prosciutto. Yes okay. So we made our own but we made it with duck breast. So we took a duck breast we cured it, we hung it and let it dry and then we would slice it real thin and we'd serve it with it. We served it with a melon carpaccio and some basil and some different things. So I was getting this dish rate and I had it over the slicer I'm slicing it. And Executive Chef comes out of nowhere and just freaks out because I'm cutting it the wrong way. Because you have to cut it a certain way and duck breasts are very thin and electric slicers are dangerous you don't want to mess with those things. I have a hand guard there for a reason. I've seen some injuries with those. So he's showing me how to do this and he this guy you got to keep in mind. He's one of the best chefs in the world he came from the Q is the coach of the culinary Olympic team in the 90s. And he can do things in the kitchen that most people can't even think about. So he's trying to figure out how he can slice this perfectly and he starts slicing it on the slicer without the handguard. And I'm like you got to be kidding me and so he shows me how to do it and walks away and I'm like looking at it thinking about it. And then the sous-chef comes over. He's right underneath the chef and he's like what are you doing and I told him I said I'm trying to figure out how to do this, he just showed me how, so he's like let me see that. So this is the guy that's like next in command right. So he's trying to do it he can't figure out. So the chef comes back over and freaks out even more because not only can I not do it but his next in command can't do it. And so now he has to do it and when you're the executive chef you shouldn't be doing work like that but he had to do it. So he was not happy. So at that time one of the food runners came over and a food runner is the person that would take the food to the waitstaff. So in this property the waitstaff would take the order from the table they would give the check to the runner. The food runner would bring it to the kitchen. We would prepare it, give the prepared food to the food runner. And the food runner would take it back to the waiter. So the waitstaff shouldn't have had to come to the kitchen. So the food runner came up to pick up a tray of hors d'oeuvre. So I'm getting him ready and I'm freaking out and she could see that the chef was over there and she just looked at me because she could tell I was in a precarious situation and she just looked at me and said you really hate your job don't you. And I looked over at the chef as he slicing this and he just like gilt up and glared at me like he's waited and I knew that whatever I said right now was gonna be very important to the rest of my professional well-being here. So I looked up for what I was doing and I said no, it's not that I hate my job I just wish I was better at it. And he liked that answer and that he calmed down. He was helping me out everything was good but that's when I realized that mindset is the most important thing because even though you can't do something or you don't know how to do it yet, if you have the right mindset and the right attitude about it it'll still get done and it'll get done at a high level. And so that was the first aha moment I had with like wow. I don't know where that answer came from. I knew it was important but I got it out there and it was the right way to answer that. It was the right way of approaching that situation. Don't hate what you're doing because you're not good at it or you're not adequate. You don't have the skill set yet just figure out a way to get better at it over time. Steve: Well I think such a good one. I'm gonna have you come back to that second one but just for the Awesomers out there listening. Not only did that probably help Mario mentally go really this is just a question of me acquiring the skills. But with the pressure of the executive chef staring down and waiting for that answer it actually diffused that Chef to write. Because he realized well gosh you can't blame the guy if he doesn't know how to do it. You actually have to teach him how to do it and so everybody kind of was able to kind of downplay that situation or at least ratchet it down a little bit. A really good example. What's your other one? Mario: Yes and well just to add to that really quickly for if the other one is you can't get mad at someone who really wants to learn and really wants to try and really wants to get better. So if you have that attitude of I just need to figure this out I'm gonna do it and I have the intent Trump's all. If you have the intention to get better and to serve at the highest level you're always gonna figure it out and you're always gonna have the support to do that. The second one was after I worked there I was always an athlete growing up and I played baseball my whole life and I always stayed in good shape. And like I said I grew up with my father being a chiropractor. So I knew the value of keeping your body in shape, having energy, feeling really good, staying at your peak in that area. Because your body is the vehicle with which experience the world. So after working in the restaurant being in all the stress the competitive environment being around great food all day long. It was like the perfect storm. And I looked up one day five years later and I was like 60 pounds heavier and I felt terrible, it bled into my attitude. I started to be just a miserable person didn't like where I was and so the first thing I knew I needed to do was take care of my body. Was to get my body back in check. I knew if I got my body back and checked my energy would go back up. I could start back up my routine at the gym and then I could figure out the rest from there and I didn't know what to do though. So I'm thinking how am I gonna pull this off. I'm working all these hours. How am I gonna get myself back. I didn't have time to sleep as much as I should have been let alone to be able to go to the gym. So I'll never forget the one day I went and I picked up my father from the airport because I was working in downtown Pittsburgh. And the airport was like 10 miles away. So as soon as I was done working, I went picked him up from a speaking gig and this is my dad right. I'm very close with my family and my father holds school Italian family and I didn't recognize him until he was like 10 feet in front of me because he lost so much weight. And I looked at him. He lost 80 pounds and I thought man you look great. So I said what are you doing, I wouldn't I need help I need to do this. So he said I'll help you but you have to do everything I tell you and I said okay. So I did everything he said, within six months I lost 70 pounds. I felt great my energy went up and that's the point where people started coming to me and saying how did you do this? What did you do? And so I started coaching them because I said here I'll just tell you exactly what he told me and I'll just do this. So just from word-of-mouth and just from doing that within six months I was making more coaching people to lose weight then I was as a chef. And that's the point where I stopped and I looked and I thought number one I feel more fulfilled because I feel like I'm making a bigger impact on people helping them get their health in check. And number two I've just been letting people come to me based on my results. What if I got intentional about this and actually went out and started talking to people and trying to help people. So that was the point where I decided I was gonna leave the professional cooking world and go out and pursue this weight loss coaching. So I did that and after aboutsix months of doing that is when I realized that on nearly all the people that I would coach would get a result if they did what I said but half of them would keep the result for the long term. Like I didn't make a lifestyle change in the other half would inevitably they'd hit their goal be really happy for a week or two and then go back to their old ways and gain on their way back and it boggles my mind. I was like how could someone put all this time effort and energy into finally achieving the goal they want to achieve and then go back to their old ways. And so I started asking a lot of questions I started asking the people that were doing and I started asking health care professionals, personal trainers, doctors, scientists, any way I could find that had experienced there. I was trying to figure out why this was happening and what I found was the differentiating factor was mindset that the half of the people that would keep the weight off. They had long term goals, they knew I want to lose this weight because I wouldn't experience life differently I want to be able to have more energy to put into my business to spend with my kids to show up in the world differently and just experience life to the next level. And then when they would get close to their goal they would set another goal. So it wasn't just I want to lose the 25 pounds they would lose maybe 23 pounds and then they'd say okay now I want to run a marathon or now I want to do a Tough Mudder and now I want to put on five pounds of muscle or now I wanted to try something else. That the levels up that goal to the next level whereas the other half of the people that would go back they would have the goal of. I want most of the time. I want to fit in this dress for this wedding I want to look great at my high school reunion the goals such as that I want to look great in my bathing suit when I go on vacation and they would get to that point feel really good and all they would focus on is this event. They get to that event they feel really good about it but then after the event was over they would step back and go well now what I just wanted to get to that event. I lost the 25 pounds and anytime we feel what I learned was anytime we feel confused or overwhelmed or there's a challenge. We always revert back to our strongest conditioning and their strongest conditioning since they weren't planning on doing that for the long term. They just plan to get to that event their strongest conditioning was what they were doing before they started to lose the weight. So they would go back to that and when they would look in the mirror they didn't change their identity. So they would still see themselves as the heavier version of themselves and when that happens it's just a matter of time before Yuri manifest that back into the world. So I knew that mindset was the differentiating factor between and when I say that I mean success because success in and of itself is not can you achieve a goal because anyone can achieve a goal achieving a goal is not really that difficult. But can you keep the goal can you maintain that goal and not only maintain it? Can you build on it can you move to the next goal if you want? If you lose the 25 pounds now can you stay there because you have did you change your identity and grow into the type of person that's 25 pounds later to experience life there. And now can you move on to do something that you couldn't have done before? So that it becomes automatic it's like when you learn how to drive when you first start to drive. You have to really focus on everything. He's checking the mirrors, you're looking where all the gears and levers are how to use the pedals which foot you're going to use and you have both hands on the wheel and you're just paying attention to everything. Ten years later after you been driving for a while or now I'm not saying this is a good thing because I don't condone this. But most of us probably drive with our knees eating a sandwich in one hand texting in the other with the radio on full-blast. This is what we do because we have this identity of I'm someone that can drive. I've done it so many times. It's just something I do and you just do it you don't think about it you just do it. And so when you make those changes in your life you need to get to the point where it's just how you show up. It's just what you do. Steve: First of all it's a little spooky because it sounds like Mario has a one of those hero cameras where does it go pro in my car. Is watching me Subway sandwiches in the hands and making calls and drinking drinks. That is definitely how I like to drive. So I definitely want to just try this point home to the Awesomers out there listen that in fact mindset is kind of the foundation that the whole structure is built on right. Your mentality, your day, the results of what you do without that mindset being started in a predictable and ideally positive way. You're letting the chips fall where they may. Where you could stack the chips up just like you want them if you try to control that. And I think that's a really important point. So first of all I love how these, your stories were or pivotal in your your history to kind of help you learn some of these lessons. How did the transition come from cooking into your podcasting and your coaching and and so forth? How did that transition happen? Mario: Well when I started coaching like I said I I dove into the mindset because I realized that was the differentiating factor between people who got the results and kept them. And people who just got the results and they went back to being whoever they were before they started. So I started really studying mindset. I got certified in strategic intervention. I started really going to any leadership seminar mindset, seminar I could go to. I read a ton of books. I listened to all the audios I could find. Really educated myself on mindset and how to make shifts in your life. So that was one thing I did the other thing I did was as I was coaching people they knew that I used to be a chef. So everyone was saying what can I eat what can I eat because people think that when it's time to eat healthy all you can eat his grilled chicken and salad. And they eat the same thing every single day and then they get tired of him don't eat it anymore. So then they go through the drive-thru and then it's a vicious cycle. So instead of sitting down with everyone one on one and trying to figure out a meal plan. I've decided to write a cookbook. So I ended up writing two cookbooks that were geared towards healthier eating and those books sent me on a media tour where I did over 50 TV shows. I had my own radio show. I had my own local TV show for a while. I wrote three different columns for the local newspaper that were weekly columns. And so I was very busy doing that and as I did that that's how I learned about podcasting. I learned about radio. I learned about media and I found that I really enjoyed that I really enjoyed spreading that message to people. And with the mindset stuff that I was working on I knew that there was a message there that could help more people than just the ones who wanted to lose weight. So I still do some weight stuff with people who want to lose weight. If they come to me specifically for that but I'm more focused on how do we spread ideas. How do I help people spread their message. How do I help you develop the mindset where because I believe that everyone has a unique calling. Everyone has this uniqueness within them that they are perfectly equipped to go out into the world to do but the question is will you put in the time and the effort to figure out what your calling is? And then to hone that over time and make it better so that you serve as many people as possible with that? Because the example I like to use is like the Beatles I mean when they were born. They weren't born with a guitar and a piano in their hands just playing like the Beatles right. They had to realize that hey I really love to play music. I really like to write music and perform so let's get together and form the Beatles and let's really practice and work on that. And what a lot of people I don't know if you've ever read the book Outliers by Malcolm Gladwell he talks about the Beatles in that book and the Beatles would go over - I believe it was Germany and they would play for hours and hours like they would play eight-hour gigs when you go to a concert here in the US. It's typically an hour and a half long but the Beatles would play for eight hours at a time day after day after day. And then when they came back to the US as the Beatles everyone was so surprised. They were the Beatles but yes they were very talented. They had that innate calling and that gift but they had to practice and put in the time to get to that level, to get to that world-class level, to become the Beatles and I believe we all have that within us maybe it's not music specifically. But you have something in you that if you put in the time and the effort and you hone that skill and you work on it. You can get to that world-class level. You have everything you need. You just need to put the time in and really focus on it and then use it to serve as many people as possible. And so I believe that my message is helping people realize that and then helping them get their message to the world to as many people as possible. So that they can serve as many people as possible with their unique gift because whatever your gift is, there's someone out there that needs. That there's someone out there that's praying for that. It's just a matter of can you show up and can you get it in front of them and if you can not only is it gonna change your world but it's absolutely gonna change theirs because they need it. Steve: Well this goes back to one of the show principles that we have here at Awesomers which we co-opted the great Zig Ziglar squishing which is something like you can have everything you want in your life if you open enough other people get what they want in theirs and that premise of being able to serve others without real kind of hard expectations is a wonderful thing. And I just love the evolution right. So you're cheffing it up, you talked to your dad he says hey here's what I'm doing you can do it too. You say I'm in, I'm gonna change that mindset. I'm going to get my mentality organized. Not only bring down the weight, all the people around you say hey this looks amazing. How do we get involved. So that's the beginning of your coaching and then that transitions kind of from the food side of it right on into the mindset side of it. So what is superlative evolution that is? Have you ever looked back and kind of quantify the best day and go this... even if it wasn't your very best day on a top 10 list. A day that you just said this was a pretty good day. Along your journey any victory lap you want to share with us? Mario: I don't think there's one. I think the first time I ever did TV was a big thing for me because it was something that I never thought that I would even really enjoy. I just did it because I wanted to get my book out there and then I ended up really loving it and at the end. I just felt like I was I was just in the flow and I nailed it and it was something that opened my eyes that said maybe this is something I'm kind of good at. And I want to do. So that kind of stands out but really I think my best days haven't come yet and that's what keeps me going because I'm still fairly young at least I feel young. So I think that I have a lot ahead of me. It's just a matter of keeping that momentum going and I tell everyone on my podcast nearly every day. I say from the minute you open your eyes in the morning. So the minute you closed but not you're building momentum it's just a matter of are you building it towards the things you desire. And towards the outcomes you want to achieve or are you letting circumstance dictate where your momentum goes. So if you leave it to chance you're gonna get chance if you have vague outcomes and vague things that you want you're gonna take vague actions you're gonna get big results. And you're gonna look up one day and wonder why you're not where you want to be. So it's all about being intentional and figuring out what direction you want to go and where you want to go and then taking steps every day to get there and enjoying the present moment because the other really lesson the really hard lesson that I take that I tell people and I say hard because it's in stone and it's something that's that important. Once I got this it kind of changed my life and it's the present moment is all we have and it's all we will ever have. We can take the lessons from the past and the wisdom that we learn and apply them to the present and the future may or may not come but even when the future does come it comes in the form of the present moment. So you never have anything other than the moment that you're in and no matter what you're doing right now in this moment. It's the most important thing period. It doesn't matter if you have a huge client meeting coming up or a presentation or that doesn't matter because that's in the future and that will come as the present moment. But right now all the things you're doing in this moment right now are determining how your future present moments show up. So even if it's walking the dog or making coffee or saying hi to someone outside that's the most important thing you could be focused on right now. And I think if we spend more time in the present moment in less time reliving the past or stressing about what could or could not come then we'll live more fulfilled because why would you. And this is the analogy I like to use for this and I'll try to keep it brief. I've never gone skydiving him but my brothers enjoyed it and that seemed terrifying to me. Okay I'm on the fence about it cuz I'm not a big heights guy but it just seems so intriguing to me. But anyway I've talked to a lot of people who've gone skydiving because a lot of people have that on their bucket list and from the stories that I've heard and all the people that I've talked to. I hear the same thing from everyone. It's the fact that when you sign up to go skydiving you're super pumped you're excited I'm gonna check this off my bucket list. I love this is gonna be great then as the time comes closer to the actual jump suspense and stress builds and builds and builds and fear starts to creep in. Then the night before you can't even sleep typically you're in your bed. This is before your first jump you're shaking you're thinking about jumping out of this plane and you're just scared to death the next day you wake up. And you somehow drag yourself to the airfield you get there and you meet the people and the other people that are gonna be jumping and the closer it comes the more fear builds you get in the plane. And as the plane takes off you're just kind of shaking and you're getting even more scared you're sweating. And you just have this sick feeling in your stomach your nauseating and you just don't know what you're gonna do then you get up with your the person you jump with and you go to the door and you hold on the sides of the door and they count down one two and they always jump on two because everyone holds on on three. So one two they jump out and you just can't say but then once you're in the air and you're hurtling towards the ground it becomes this magical experience where you are just in such ah. And it's just so amazing and that's like the pinnacle of the whole thing and then once you float down to the ground they always want to do it again. And what strikes me about that is why is it that the only moment in that whole scenario when any danger could possibly happen is the moment where fear doesn't exist the whole time leading up to that you're in no danger. But it you allow it to affect you so much and then when you're in the air and tragedy could strike at any moment. It's the best moment in the world and so that makes me think why should we let what may or may not happen in the future. Affect the perfect moment that we could have right now. And so if we can live more in the present and realize that the future is just made of those present moments and be more present with the people with the things around us with the activity that we're doing, with who we're serving and how we're serving them. I think that it could really make your life much more fulfilling. Steve: For sure. I think that's a very very good point. I hope that people are taking paying particular attention to this idea. That we're so often focus on that future right as you say which may or may not come that we our mindset gets polluted in the end now and we don't enjoy the journey right. And that's to me part of the the the secret to life is enjoying the journey right. The destination is Six Feet Under if you're religious and maybe there's something else after there but still on this earth that's coming to an end and you're six feet under. And no reason to race to it enjoy that journey and I think that is all about your mindset and getting it right. So maybe you could share with this your GIO concept that you talked about which you defined earlier but I have you dive into that because I find that to be a very I like anything systemic. And so you're waking up each day and you're putting this GIO process into place what does that look like. Mario: Yes and this is it's how we start every single podcast. So I take if I have a guest on I take at least three minutes to do this before the guest comes on if and a lot of times I do the podcast solo. So I will even stretch this out to six or seven minutes and go more in depth with it because it's that important GIO is the way in which we start today it's journey meditation exercise that I use start each and every day and set the foundation for my day. And it is GIO but I like to start from back to front and I work it that way and I start with the O. And the O is outcome. So first and foremost we need to figure out what is our outcome. When you think about your outcome it has to be two things it has to be clear and it has to be compelling. When I say clear I mean specific, so what specifically do you want I have what I call an outcome journal. And it's a little notebook and I'll show everyone here this is my outcome journal that's watching on the video feed. And the only thing that goes into this notebook every single morning is my outcome. I have it distilled down into one powerful sentence that resonates with my psychology and everyday I write it. I read it and I say it aloud so my mind is solely focused on the outcome that I want to achieve is this. The daily outcome that you're trying to achieve or what does the outcome based on the timeline my outcome is what I'm most focused on right now. So sometimes it is a daily outcome if that's if today I have to get this done this is the most important thing to me but typically it's an outcome that I'm working on right now. So whatever with my business right now what's my next milestone what's all the all the activities that I am going to put into where are they leading me and that's how I can determine what activities I'm going to do. And what I'm gonna participate in I always start with that outcome you need to know what it is specifically that's why I write it every day because as I take action each and every day it may change that outcome just a little bit because I get feedback. I figure out I see where I'm going I see what's happening. And so it's so interesting to me to go back in my outcome journal like three months and read that outcome and then look at today's because typically they're on the same trajectory. But it's a living statement and that's what I say it's organic because it's it changes. It can change from day to day slightly but when it changes it becomes more specific and the more specific. I get it the more compelling it becomes and the more I can put energy and focus behind it and I want to take action because you remember we don't always do what we should do but we do always do what we must do so when you get that so clear and so compelling. It becomes a must and you can't see yourself not achieving that and not experiencing that in your life and that's part visualization. So the first part of the exercise this outcome part is the journaling part because I journal and I write that out and I focus on that then that takes us into the eye of GIO which is intention and when I say intention I mean now that what you want and why you want it what do you intend to do about it. And so intention means action to me. So this is where I'm not a big guy on to-do lists because I think people when they do to-do lists they focus more on the action but the action doesn't really matter. The action can change for instance wherever you're sitting listening to this podcast right now or whether you're on the treadmill or whatever if your goal was to get from where you are to one mile away from where you are. There's an infinite number of ways you can do, that you can walk, you can run, you can crawl, you can take a bike, you can take a bus, you can take a car, you can take a plane, you can probably even take a drone these days. But there's an infinite number of ways you can get from where you are to one mile away. However there is a more effective way depending on what your desired outcome is if speed is your desire is your desired outcome then it's probably more effective to take a car than it is to walk. If being environmentally friendly is your outcome then it's better to walk than to take a car. So it just depends. So the action really isn't important what's important is your outcome and you build your actions based on your outcome based on what is it that I want and how can I get there. How do I think I can get there as quickly as possible. So I said three intentions every day with that outcome front and center number one what's one thing I can do right now within the hour because right now when my outcomes front and center in my mind. I'm nothing else distracting me I want to make sure I get at least one thing done that's gonna help me build momentum towards that and it starts my day with a sense of achievement. So it's one thing I can do within the hour. Second one's one what's another thing I can do within the 24 hours of today. So that by the end of today I have two outcome focused action items that I get done and if you do that only Monday through Friday that's ten action items that you're gonna complete every single week that's 40 every month which really compounds and becomes a lot the third thing is what's one thing that I can focus on a little bit each day. That's maybe a longer scope project, maybe it's something I collaborate with other people on but it's something that keeps that outcome in the back of my unconscious mind at all times. So that when things come up and I'm out in the world since it's always playing in the background. It's like those windows you have on your computer when you open a new tab but the other tabs are still running in the background. If you have that in the back of your unconscious mind. Now when things come up you can see them as an opportunity and you can act on them whereas if you're not have you ever gotten a car an outfit or a phone or something that you really wanted for a while. And then you get it and all of a sudden you notice everyone else around you has the same thing or you see it appear more of course it's not that it's appearing more. It's just that now that you're focused on it and you have it you start to notice it more. And so that's what you want to do with that with that thought that 24 were you doing something a little bit each day over a longer period of time and finally this all comes down to the GNGO which is the x-factor or the state that you're in. And that's gratitude is what I choose for that state because when you're in a true state of gratitude you cannot feel a negative emotion and when you're truly grateful the more you intentionally get into gratitude and the more you focus on that and you do it intentionally more it'll show up in your life in other areas when you're not even really thinking about because we all have to follow the motions. We all have emotions that we default to, if you make gratitude your default emotion then it'll start to show up in other places instead of being angry or confused or frustrated. What if you replace that with gratitude so that you would become more appreciative instead of expecting something to happen to being disappointed it didn't. What if you became grateful that you had that? So there's three things that I focus on every day when it comes for graduating this is where meditation comes in. I close my eyes for at least five minutes every morning and I think about what's one thing that I get to receive every day what's one thing that maybe I have fallen into the law of familiarity that I don't notice that I tend to take for granted a little bit that I can now focus on and build massive amounts of gratitude around that. I like the small things because the small things lead into the big things and if you can build massive amounts of gratitude around the small things and you'll be able to build even more gratitude around the big things. The second thing is what's one thing that I get to give every day because we have the power to control what we give when we given how much we give and giving is what ultimately leads to receiving and contribution is ultimately what leads to fulfillment. So what's one thing that because I give that to the world and I put it out there it creates an impact and then leads to fulfillment in my own life and finally what's one thing that I am that I can be grateful for because I am or two of the most powerful words you can say and your identity. Determines your beliefs which determine your results. So instead of using negative self-talk instead of putting yourself down and being hard on yourself become your own biggest fan do it on purpose tell yourself things like I am perfect at my core. I always make it through, I always find a way, I am unstoppable life is happening for me and when you tell yourself those things and you do it intentionally over time. What you tell yourself you will begin to believe. So when you're telling yourself those things you'll begin to believe them and as I said earlier whenever we're confused or we come up against the challenge or an obstacle. We always revert back to our strongest conditioning. So if you condition yourself to show up as unstoppable to believe that you always make it through to believe that life is always happening for you. Then when those obstacles come up, you'll show up that way you'll break through those barriers you'll begin to transform it and create that new identity that is capable of achieving the outcome that you want to achieve. And then it has no choice but to show up in your life. Steve: I really love that and yes I'd like particularly how you brought this idea of you know kind of dropping in these these little bread crumbs for ourselves. Not just the mindset clues right. I am worthy I'm really great at this I always find a solution to every problem right. That positive reinforcement it works by the way the negative reinforcement also works. So don't do that right it's like I never get this right or everything bad happens to me all that kind of stuff you got to get rid of it if you can but you reference the the baader-meinhof phenomenon which is this concept of once you buy the red Corvette or whatever you see red Corvettes everywhere. And I think it really has a high degree of parallel because if you surround yourself with positive mentality and that the intent and the gratitude. And the outcome all of those things are kind of threaded into your day your the the phenomenon basics you guys can go ahead and look it up on the internet. But it basically says you're gonna see those patterns more likely because you're a part of those patterns. Now they existed by the way the entire time they you know that nothing has changed in the world except your mindset and that's why I think that's such a powerful thing. So thank you for bringing that up that's amazing. Mario: And just to add to that there's a part of your brain called the reticular activating system or the RAS and that's what's responsible for guiding your focus. So as people if you sit and you look around the room even that you're in right now. There's a million different things you could be focused on you could be focused on all the different sounds. All the different conversations. All the different lights on everything but your brain has this unique ability to focus you in on the one thing that it believes is the most important to you. Whether that's the most important to get you to your outcome or most importantly to keep you alive. And so if you can train your brain to focus on what you want it'll start to find those things that you want and help you focus on those things and that's what's so important about what you just said. Steve: Boy I really... I just... I support this concept that getting your mind right. The first thing every day this seems like a very very good idea Mario tell us how do people find you. We talked about your your podcast clearly they can find that you must have a website can you share that with us. Mario: Yes my websites marioporreca.com really, it's by name M-A-R-I-O-P-E-R-R-E-C-A.COM and you can go there. and for the podcast you get 10minutemindset.com, it's 10minutemindset.com and that'll take you to the podcast page on the website. So those are the best ways to find me and all my social media links and everything around my website. Steve: I love it I definitely think your you're doing really important work out there for Awesomers and anybody who wants to break that paradigm of normal anybody who wants to get into the world of achievement where it's sustainable and it's enjoyable instead of pressure and noise. And all the kind of ugly parts of achievement right. I don't envision a world where I have to work you know 80 hours a week to to live my fullest life and I've done that type of things before. So now over the course of my last 30 years I've seen better ways right and I've had some good fortune along the way and and been able to figure out hey there's there's smarter better faster ways to achieve what I want to achieve. And again enjoying the journey as part of that. So I really love having you on the show I appreciate all of your great bits of wisdom I just wonder is there any kind of final message you'd like to leave with the Awesomers out there listening. Mario: Yes. I guess just what you said just to back up what you said about not wanting to work the 80 hour weeks and all that stuff that you're capable of it you've done it but you don't want to do it and I tend to want to look at it from a place of instead everyone preaches work/life balance right. So you have to balance your work life and your home life not but I don't really buy into that theory. What I think is more important as work-life integration. So if you have a mission that you're passionate about if you have something that lights you up whatever that is and keep in mind that whatever that is when you find it not something you have to balance because it just becomes part of who you are and you find it doesn't if what you're doing you're super passionate about. And you love it's not going to negatively affect any other part of your life if it's what you're meant to be doing and you're passionate about it. It's going to by default enhance everything else in your life. So if you're doing something that's very meaningful to you that you love that you're passionate about that you're on purpose it's going to make your home life or your family life even better. Because you're going to show up more there too. So finding that there's no such thing as work/life balance when you're looking for your purpose, how can you have a work-life integration where it's all just one thing you show up as that person you live your life as that person you're fully present with everyone around you and in every present moment of your life and because of that you make your largest impact and you're really fulfilling your unique calling and not only are you creating fulfilment within yourself but you're serving the world around you at your fullest capacity. Steve: I love it Mario, excellent, excellent sage wisdom for such a young fella I definitely appreciate it. It's been very nice having you on the show. Awesomers we will be right back after this. Catalyst88 was developed to help entrepreneurs achieve their short and long term goals in E-commerce markets by utilizing the power of shared entrepreneurial wisdom. Entrepreneurship is nothing if not lessons to be learned; learn from others, learn from us. I guarantee that we will learn from you. Visit catalyst88.com because your success is our success. Hey Gideon. You're listening to the Awesomers podcast. Steve: White as always I just love a good origin story and kind of understanding Mario's background and seeing where he came from and some of the journeys been on. I always find it very interesting and often inspiring the little tidbits that we learned about you know and cooking and becoming a chef and working crazy hours and kind of all the little twists and turns that it takes. I always enjoy these stories and I sure hope that you do too now this again was episode number 36 of the Awesomers.com podcast series and so all you have to do is go to Awesomers.com/36 to find the relevant show details and notes etc. Well we've done it again everybody. We have another episode of the Awesomers podcast ready for the world. Thank you for joining us and we hope that you've enjoyed our program today. Now is a good time to take a moment to subscribe, like and share this podcast. Heck you can even leave a review if you wanted. Awesomers around you will appreciate your help. It's only with your participation and sharing that we'll be able to achieve our goals. Our success is literally in your hands. Thank you again for joining us. We are at your service. Find out more about me, Steve Simonson, our guest, team and all the other Awesomers involved at Awesomers.com. Thank you again.